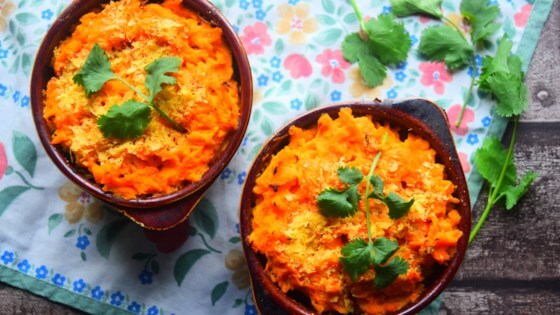 "This vegan shepherd's pie is comforting, healthy, delicious and really easy to make. You can also make it in batches to freeze and serve when you don't have much time to cook. We used lentils to make ours, but you could use chickpeas instead, if you'd prefer. Serve with fresh cilantro if desired." Heat coconut oil in a saucepan over medium-high heat. Add red onion, white onion, cinnamon, ginger, garlic, and 1 teaspoon cumin. Cook, stirring gently, until soft and tender, about 5 minutes. Add lentils, tomatoes, stock, and maple syrup. Bring to a boil; simmer filling until flavors are blended, 20 to 30 minutes. Place sweet potatoes into a large pot and cover with salted water; bring to a boil. Reduce heat to medium-low and simmer until softened, about 20 minutes. Drain water; add coconut milk and remaining 1 teaspoon cumin to the sweet potatoes. Mash until smooth. Pour filling into a large baking dish; add the sweet potato mash on top and a sprinkle of nutritional yeast. Bake in the preheated oven until top is browned, about 20 minutes. Convert a comfort food classic into a tasty meal that's totally vegan. Honey can be substituted for the maple syrup, if you aren't vegan.